कालभैरवं= காலபைரவரை, भजे = பஜிக்கிறேன் . உள்ளவர் .வேண்டியதை எல்லாம் கொடுப்பவர் . 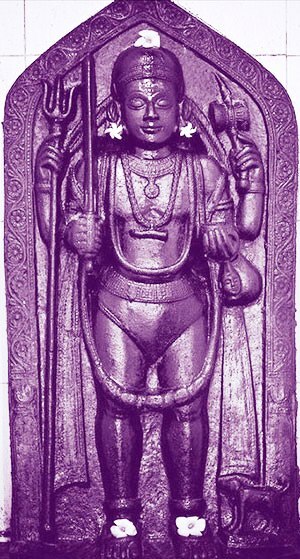 முக்கண்ணன் . காலனையும் நிக்ரஹம் செய்த இவர் ம்ருத்யு பயத்தைப் போக்குபவர். He shines as the appearance of lakhs of ( crore ) suns at a time.He ferries us safely ashore, who are suffering in the ocean of birth,The Supreme Lord.He has eyes that of lotus( beautiful ) & dark blue colored throat ( Similar to Lord Shiva).Fulfils all our wishes with an eye of fire ( third eye ) in the forehead.He even destroyed the God of death( Yama - to protect his devotee).He dispels the fear of facing death .He is eternal.He is ever present in all places at all times. I worship The Lord of Great city of Kasi. Sri Swarna Akarshna Bhairavar idol carved in stone. ( Sri.Soundarraja Perumal temple,Thadikombu, 10 kms south of Dindigul( Madurai ),Tamilnadu.Though this is a Vaishnava temple, Vilva is the Sthala Vruscha here.This Lord Soundarraja is said to be the same Lord Kallazhar at Thirumaliruncholai - Madurai.Temple dates back to 500 years built by Sri.Achutha devarayar of Vijayanagar Empire.Swarna Akarshana Bhairavar solves the economic problems of devotees.All the sculptural works in this temple is exceptional.One has to directly visit this temple to have a feast for their eyes.Photo courtesy - TN TEMPLE ,Tamilnadu All Hindu temples.